Every film demonstrating that the U.S of A isn’t always the promised land and showing another cover-up, always arouses my curiosity. When someone starts to dump horseshit over them, I’ll make sure I’m sitting in the front row to gloat. (That’s why I’m a fan of Michael Moore). Guaranteed, these films are not super patriotic. No excessive praising of the American army. And slogans like “We will prevail” and “God blesh America” aren’t generously scattered around. It’ll always remain a secret if the invasion of Iraq was based on untruths or false information. I’m sure it was a lucrative intervention for some parties in the world. I’m certainly not doubting that. I was curious how the Americans would portray this in a Holywoodian way. I expected an open end where you could actually still doubt whether it happened that way. Eventually they made a realistic film in good conscience, where the outcome is the message “O.K. we lied a bit, but in the end we saved the country”. Hip Hip Hooray. 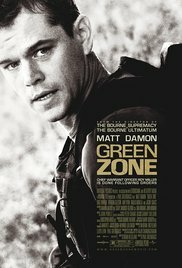 It was a fast, action-packed war film, interspersed with political / diplomatic blahblah and with an excellent Matt Damon in the lead. And of course another journalist and someone from the Pentagon are introduced after a while. The first one regrets it that she ran a story on Magellan without checking it. The second one regrets nothing. Terrible cliché. The denouement with the Iraqi Freddy (Who came up with that name? ), was so predictable. You saw that one coming a mile away already.